Discussion in 'Art & Design' started by ParadEyes, Jun 17, 2009. This guy is unbelievably brilliant , he deserves a thread on his own. 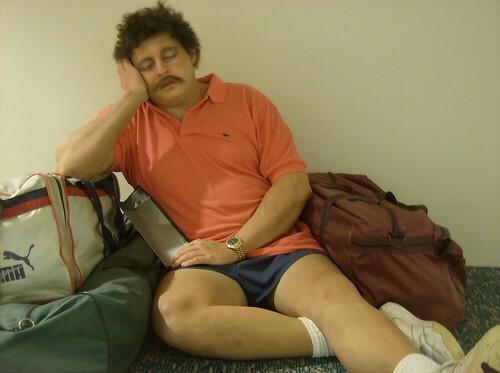 Duane Hanson is well known for his hyper-realistic figures made of polyester and cast fiberglass enhanced by real clothing, accessories, and props. The realism of his sculptures draws the viewer in for a closer look and links Hanson with the Photorealist painters who also explored methods of copying as a form of image-making. Hanson’s intent, however, was not merely to reproduce reality but also to comment on the human condition. His subjects are ordinary people leading unremarkable lives—a cleaning lady, a woman shopping, a museum guard. Duane Hanson's sculpture "Drug Addict" from 1974 (together with an unidentified museum guest). Picture taken at an exhibition at the Louisiana Museum of Modern Art, Denmark. ^ lol. I should've added "sculpture" to the title. Yea, most of his sculptures are of fat, random, shallow looking people..or people you wouldn't bother to notice. He is being very critical on americans in his work..but it's humorous. he is totally awesome! I've seen three of his sculptures in diefferent museums so far and they are really stunning! These are even more awesome when display in a good collective exhibition. I kind of find it boring when this sculptors are on their own, in a white box. George Segal is also very interesting to look at, and is from the same period.